The fighting since April 2006 has caused large-scale internal displacement in the countrys north and east. In addition to the economic and psychosocial impact, displaced persons in some areas are vulnerable to intimidation, violence, and abductions by paramilitary groups. In some cases the government has forced internally displaced persons (IDPs) to return to their homes against their will and without adequate security or humanitarian assistance. While some displaced persons have moved in with relatives elsewhere in the country, many have gone to displaced persons camps or other places of refuge, where conditions are typically poor. Some of them have been displaced multiple times. As fighting raged between the government and LTTE in the districts of Trincomalee and Batticaloa in late 2006, the LTTE at times prevented civilians from fleeing the conflict zones, probably because the presence of civilians made it easier for the LTTE to conceal its members and hindered the government from an all-out attack. The civilian population also remains a source of ongoing LTTE recruits, both voluntary and forced. In mid-December at least six civilians drowned trying to make it by overcrowded boat to government-controlled territory.24 Many of these displaced persons had fled previously from areas to the north and east, such as Mutur, Sampur, and Kantale in Trincomalee district. The LTTE has restricted IDP movement at other times over the past year, most notably on August 4, 2006, when about 27,000 civiliansMuslims and Tamilsfled shelling in the Mutur area in Trincomalee district, and headed by foot towards Killevedi town. En route, LTTE forces stopped them, claiming the road ahead was mined, and directed them towards Kinanthmunai in LTTE-controlled territory. Along the way, LTTE cadres separated the men from the women and children and forced the men to walk past two masked informants, who were apparently looking for members of Muslim armed groups or the Karuna group, which had been active in Mutur. The LTTE removed from the line at least 32 mostly young men, nearly all of them Muslims, tied their hands behind their backs and pushed them to the ground. After an altercation in which an LTTE cadre shot and killed one of the civilians, the army was alerted to the LTTE presence and began to shell the area. The shelling reportedly killed several LTTE cadres (including the LTTE commander) and one of the masked informants. Everyone fled the scene. Families became separated, including parents from their children. Another civilian of this group dieda womanbut the circumstances are not known.26 The surviving displaced persons all eventually reached camps in the vicinity of Kantale. 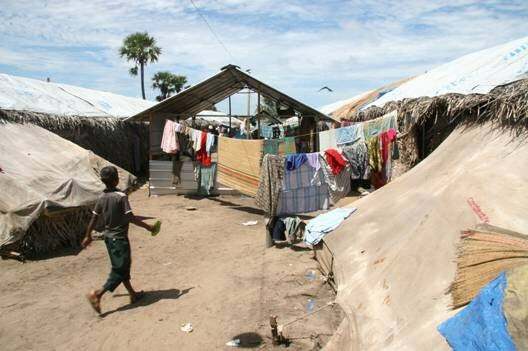 More than 150,000 Tamil displaced persons are currently staying in IDP camps and private houses along the coast in Batticaloa district.27 The government has failed to provide them with the security and protection they need. The main threat for those in government-controlled areas comes from the Karuna group, which throughout late 2006 and early 2007 has intimidated, threatened, and at times abducted displaced persons. The Karuna groups presence vastly expanded in early 2007 with the groups political party, Thamil Makkal Viduthalai Pulikal (TMVP), opening new offices around the district, some of them staffed with abducted children and young men. Armed members of the group are routinely visible along the main coastal road and in Batticaloa town. International humanitarian workers reported seeing checkpoints near TMVP offices in Batticaloa town run by men and boys in civilian clothes. The next wave of forced returns took place over roughly a one-week period in March 2007, when the government forcibly returned displaced persons from eastern Batticaloa district to areas around Trincomalee. Some returned to their original homes, if they were not destroyed, but hundreds of displaced persons from Sampur and East Mutur, forced to flee during fighting in August, were placed in a makeshift camp in Killevedi, a cramped series of sites about three hours drive from Trincomalee town and surrounded by Sinhalese communities. According to aid workers who have visited the sites, food and security are major concerns. The events are described in more detail below. Beginning March 12, the government returned people from at least six divisions in Batticaloa district. More than 900 individuals were sent to Trincomalee district as part of a plan to return approximately 2,800 internally displaced persons. The returns were accomplished with a range of abuses. The government notified some displaced persons slated for return one or two days in advance by placing lists of names at camp sites. The lists identified persons who had refused to sign letters consenting to return and those who said they were scared or unwilling to return.34 To pressure individuals to return, government officials and military personnel threatened to withdraw humanitarian aid, food, and other essential supplies.35 Some officials threatened families that they would revoke their family cards, which entitle them to food rations. In some cases, the security forces reportedly have said that they would no longer be responsible for the security of the displaced persons who stayed behind. In addition to returns to Trincomalee, beginning March 14 the government returned an additional 200 families to the Vaharai area. It remains unclear to what extent those returns were voluntary because of little international monitoring. However, in February Human Rights Watch interviewed more than a dozen displaced persons from Trincomalee and Vaharai, and they all said they feared going home. Most cited security concerns, particularly if fighting resumed between the government and the LTTE. Some said they were worried about reprisal killings by the military after an LTTE attack, as well as communal violence from neighboring Sinhalese communities. They mentioned abductions by the LTTE as another prominent concern. Shortly thereafter, the UN distributed leaflets in Sinhala, Tamil, and English on the rights of the displaced. If you want to go home, it is important that you know it is safe to do so and that you will be able to start your life at home again with dignity, the pamphlet said.43 This move sparked some criticism of the UN as ordinary people felt they had no one to complain to when their rights were violated and blamed the UN for printing leaflets and doing little else. Despite UNHCRs public statements, other reports indicate different conditions. According to humanitarian workers present at the sites, between May 14 and 17 the police and STF maintained a heavy and coercive presence during the returns. According to one humanitarian agency on the ground, STF officers told some displaced persons that they would face trouble if they did not return and implied that refusing to return would mark them as connected with the LTTE. At one site the STF told displaced persons that if they refused to go home they would never be allowed to return. Also, extremely poor conditions in the Batticaloa IDP camps are pushing some people to return despite a lack of information and their fears of unsafe conditions. Aid workers on the ground told Human Rights Watch that the return process, coordinated by the Ministry of Resettlement and the STF, was much improved from the forced returns in March, with no reported cases of physical abuse. However, many displaced persons were not properly informed of the return process and their rights, and some complained of intimidation from government security forces. Eight months later, on May 30, 2007, the president established a so-called High Security Zone in the areas of Sampur and East Mutur, encompassing approximately 90 square kilometers.49Government regulations forbid any person, including local residents, from entering or remaining in the newly designated area without written permission from the competent authority, currently Maj. Gen. Parakrama Pannipitiya. In the past, the government has established High Security Zones to protect military camps and strategic installations from LTTE attack. The CPA petition drew attention to the fact that lands covered in the High Security Zone also come under the Trincomalee Special Economic Zone.53 The petitioners state that although commercial activity is allowed in the Special Economic Zone, thereby enabling commercial enterprises to enter and remain in the area, the High Security Zone prohibits ordinary residents from entering and residing on their lands. On July 17, the Supreme Court rejected the CPAs petition, and accused the organization of trying to create news for international consumption.54 Chief Justice Sarath N. Silva called on the petitioners not to bring sensitive issues that affect national security before the judiciary. International law provides that persons internally displaced by armed conflict or other reasons have the right to voluntary return to their land in safety and dignity.56 International humanitarian law prohibits the displacement of civilians except for their own security or in case of military necessity. Political motivations cannot be used to justify military necessity.57 In this case, the government has not provided reasons to show military necessity or security concerns to justify preventing civilians access to their land and property. 17 UN Inter-Agency Standing Committee briefing, April 12, 2007. 18 United Nations, Joint UN North East Situation Monitoring ReportMarch 2007, March 2007. 19 UN Commission on Human Rights, Guiding Principles on Internal Displacement, UN Doc. E/CN.4/1998/53/Add.2 (1998), noted in Resolution 1998/50, http://www.unhchr.ch/Huridocda/Huridoca.nsf/0/d2e008c61b70263ec125661e0036f36e?Opendocument (accessed May 22, 2007). Detailed recommendations on confidence building and stabilization measures for displaced persons in Sri Lanka can be found in United Nations High Commissioner for Refugees (UNHCR), Humanitarian Plan of Action: Guidelines on Confidence Building and Stabilization Measures for IDPs in the North and East, July 21, 2006. 20 See International Committee of the Red Cross (ICRC), Customary International Humanitarian Law (Cambridge, UK: Cambridge University Press, 2005), rule 129, citing Protocol II, art. 17(1). 21 Sri Lanka Monitoring Mission, Urgent Concerns over Alarming Situation in Vakarai Area, December 12, 2006, http://www.slmm.lk/press_releases/SLMM%20STATEMENT%20VAHARAI%20121206.pdf (accessed May 14, 2007). 22 Human Rights Watch interview with displaced persons in camps around Batticaloa district, February 25, 2007. 23 Human Rights Watch interviews with displaced persons in camps near Valaichchenai, February 26, 2007. 24 Six Civilians Drown Fleeing Sri Lanka Battle Zone, Agence France-Presse, December 15, 2006. 25 Human Rights Watch interview with displaced person, Valaichchenai, February 26, 2007. 26 Human Rights Watch interview, Colombo, August 22, 2006. See also University Teachers for Human Rights (Jaffna), Hubris and Humanitarian Catastrophe, August 23, 2006, http://www.uthr.org/SpecialReports/spreport22.htm (accessed May 23, 2007). 27 Recent months saw two large IDP waves from the Vaharai area to government-controlled territory in Batticaloa district: December 12-18, 2006, and January 26-28, 2007. 28 Human Rights Watch interview with humanitarian worker, May 22, 2007. 29 Human Rights Watch interview with humanitarian worker, Batticaloa, February 26, 2007. 31 Human Rights Watch interview with humanitarian worker, Batticaloa, February 28, 2007. Human Rights Watch also viewed camp records that showed that police and Special Task Force (STF) personnel had visited the camp on January 7. 32 Refugees International, Sri Lanka: Forced Return Threatens Safety of Mutur Displaced, September 11, 2006, http://www.refugeesinternational.org/content/article/detail/9408/ (accessed May 23, 2007). 33 Sri Lankan government response to Human Rights Watch, July 12, 2007. 34 Human Rights Watch interview with humanitarian worker, May 23, 2007. 35 The Sri Lankan government told Human Rights Watch that all those who have chosen not to be settled are continuing to be provided with all required assistance from the Government of Sri Lanka. Sri Lankan government response to Human Rights Watch, July 12, 2007. 36 Human Rights Watch interview with humanitarian worker, May 23, 2007. 39 Human Rights Watch interview with IDP from Muttur, Valaichchenai, February 26, 2007. 40 Human Rights Watch interview with IDP from Kunjalkalkulam, Almkulam IDP camp, Batticaloa district, February 25, 2007. 41 More than 40,000 civilians flee latest fighting in eastern Sri Lanka, UNHCR News Stories, March 13, 2007, http://www.unhcr.org/news/NEWS/45f6bb704.html (accessed July 2, 2007). 42 Sri Lanka: Government Assures UNHCR Involvement in Future IDP Return, UNHCR Briefing Note, March 16, 2007, http://www.unhcr.org/news/NEWS/45fa70394.html (accessed May 12, 2007). 43 UN Inter-Agency Standing Committee Country Team, Returning Home. For the pamphlet in all three languages, see http://ochaonline2.un.org/Default.aspx?alias=ochaonline2.un.org/srilanka (accessed May 12, 2007). 44 Simon Gardner, Sri Lanka Clashes Kill 15, War Refugees Resettled, Reuters, May 14, 2007. 45 Sri Lanka Begins Resettlement of War-Victims, Press Trust of India, May 13, 2007. 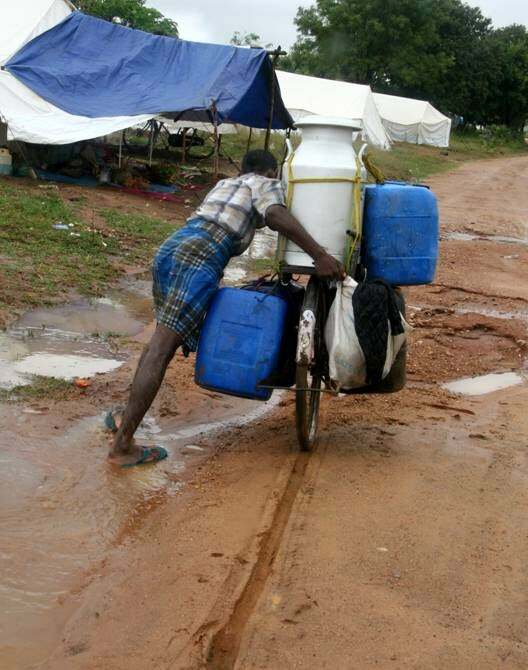 46 Sri Lanka: UN Refugee Agency Assists Return of Thousands Who Fled Conflict Zone, UNHCR Briefing Notes, May 15, 2007, http://www.unhcr.org/news/NEWS/464982332.html (accessed May 15, 2007). 47 UNHCR press briefing, May 29, 2007. 48 Speech of President Mahinda Rajapaksa at the 55th Annual Convention of the Sri Lanka Freedom Party, September 4, 2006, http://www.presidentsl.org/data/html/news/200609/20060904news-1.htm (accessed July 16, 2007). 49 The High Security Zone was established under Emergency Regulations (section 5 of the Public Security Ordinance) published in Gazette Extraordinary No.1499/25. 50 Article 12 of the constitution states that all citizens are equal before the law and no citizen shall be discriminated against on grounds specified in the constitution. Article 14 provides for the freedom of movement and the right to choose ones residence within Sri Lanka. 51 Centre for Policy Alternatives, Background Note on High Security Zone Case, July 10, 2007. 52 Speech delivered by R. Sampanthan, MP, Trincomalee district, on the Adjournment Motion relating to the declaration of Mutur East-Sampur as a High Security Zone, June 20, 2007. 53 Under Section 22A of the BOI Act No. 4 of 1978, published on October 16, 2006, by the Gazette Extraordinary No. 1467/03. 54 Sampur FR Petition Dismissed, BBC Sinhala, July 17, 2007, http://www.bbc.co.uk/sinhala/news/story/2007/07/070717_sampur_hsz.shtml (accessed July 24, 2007). 55 Sri Lankan government response to Human Rights Watch, July 12, 2007. 56 UN Commission on Human Rights, Guiding Principles on Internal Displacement. 57 See ICRC, Customary International Humanitarian Law, rule 129, citing Protocol II, art. 17(1).